For a travel junkie like me (here's CMK TRAVELS series for your indulgence), a passport is a bare necessity. And since my passport will soon be expiring this February 2017... it's renewal time! 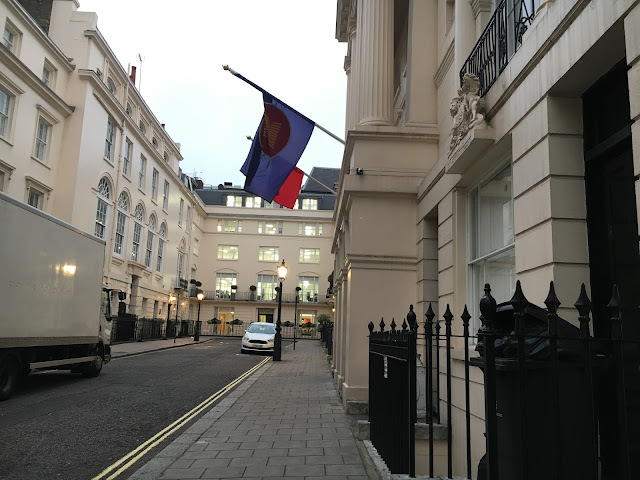 It was a double whammy because this was my first time to a) renew my passport and b) the renewal site will be at Philippine Embassy in London, United Kingdom. As you may have experienced, dealing with most of Philippine government agencies require lots of preparation and patience. I'd like to be optimistic about it so I'd like to give you guys tips based on my first hand experience. Make sure you have all the required documents with you (more on this later). If you have any unique and/or complex queries, send an email to the embassy contact email address first. Don't make the mistake of going there uninformed because more likely, you'll be wasting your time and chances are, you'll be told to go back (I reckon by this time, you'll be in the hulk mode). I'd suggest you go via email route. I tried to email them and I got a response within 24 hours. It may be sheer luck but I got my reply after sending my query after a day. If there's one thing that will save you a lot of stress... go there EARLY! And when I say early, it means... early early! I got there at 7:30 am so yes, I waited for 1.5 hours before the embassy officially opened. I'm happy that I made friends with Tita Evelyn. We chatted like crazy so hours went by just like that. 1. Get a stub (and quick!). This will serve as your service number. 2. Wait for your number to be called, go to the window (you won't get lost because uhm, there's only one window) and pass all your documents. 3. Pay your fee to the cashier (very important of course). 4. Proceed to the Biometrics room (one floor up). Here, you'll have your photo, signature and finger prints taken. 5. Once done, they'll inform you that you can claim your passport within 2 to 3 months (on the average). To give you a brief background, I went to the embassy at lunch time and I was #83. The number on the screen was #43 and it's taking them approx 20 mins. per person. Needless to say, I went back to the office because there's just no way I'll waste my time waiting for who-knows-how-long. Immediately the day after, I got there at 7:30 am. And... tadaaan! Guess what's my number? Number 1! This time, it took me 30 minutes tops to finish the whole process. 1. Email turnaround time. I'm quite happy that I got a response from them within a day. 2. The lady who assessed my requirements was on point. You see, I have a situation whereby I need to extend my passport validity in time for a Christmas trip, however, she said that they allow these for emergency purposes only. I'm not 100% happy about the answer but c'est la vie. 1. I have to wait for another 15 minutes or so (as if waiting for 1.5 hours was not enough) because the person taking the biometrics was late! It's very sad because we have all these people (who are renewing) and their time are obviously important. I don't want to sound preachy but if there's a need for another person, I think it's wise to hire another full time equivalent, isn't it? 2. Everything is manual. The biometrics person still types your details manually (no wonder the process takes so much time). Some embassies do an online application (so why not do it here?). This would be such a massive time-saver to invest on these solutions. 3. Passport renewals take 2 to 3 months. Seriously? I think we Filipinos can do better than that. Okay... inhale, exhale. *fanning my right hand in front of my face*. Whew. I'm sorry if this post is a bit moany. I'm just telling it how it is. On a lighter note, I believe we have such wonderful brain resources and all we need to do is put that to work. Things happen indeed for a reason... Hanggang dyan pala Filipino time and ways pa rin? I am planning to have my passport renewed this november although mine will expire on june 2018 ( it's because i plan to have a holiday in he philippines next summer). However, i also have travel plans for december this year. Do i have to surrender my old passport to the embassy, even though it is not expired yet, while waiting for a renewed one? How long did it take to get your passport Ate? Thanks for your quick response ate!Merry Christmas & Happy New Year din! :) I just booked a flight ticket back home in April next year & I didn't realize about travelling with less than 6 months validity on my PH passport will be a problem, I been thinking about passport renewal but because my flight is on the 27th of April medyo alanganin ako mag renew baka sakaling di dumating before my flight. Hehe. Hi again! Tanong ko lang if yung birth certificate certified by NSO is still acceptable? Hi :) did you receive a phone call or email to collect the passport?